On the Sabbath table, the food which has the highest priority of all is bread, the quintessential staple food. As we bless the challah all participants lay hands on the braided bread. After the prayer, which reminds us of the source of our food, the bread is broken and passed around. When people “break bread” they share more than just a meal; they come together in body as well as spirit. 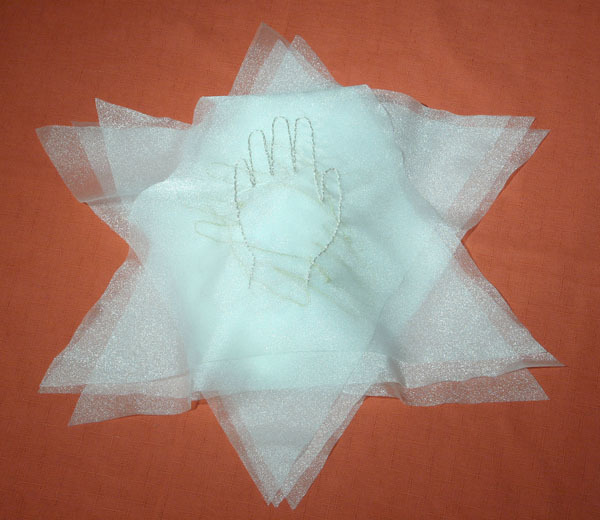 Six triangles forming a star of David, with embroidered hands of different colors, symbolically connect and protect Jews around the world.